Recently when I was thinking about services and how frequently things don’t make any sense, outcome measures and even new “models” of care such as recovery, are becoming the mirrors, bells, ladders and perches of our systems. Meanwhile the people that we aim to help, and their families, are out there struggling with painful experiences, difficult feelings, traumas and emotional pain, and they are just like the budgie. Unable to speak and crying out to be cared for in the most basic, but most important and fundamental ways. I was introduced this week to a campaign that is attracting attention across the UK and such is the campaign’s high profile that it has been referred to in a speech by Jeremy Hunt, and mentioned in government papers. 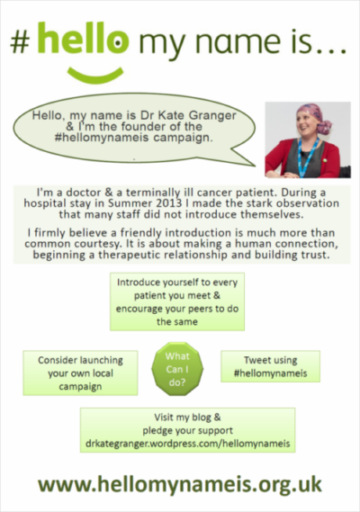 The campaign is led by Kate Granger and is called “Hello My Name is……..” Kate is a doctor who is terminally ill. Her experience when receiving care herself, was that compassion and basic human interactions were not happening. This was to the extent that she was surprised how many staff didn’t even introduce themselves to her. As a reaction to this she started the campaign to encourage people to start all interactions with this common courtesy. Kate hopes that workers remembering to introduce themselves may be the beginning of a conversation that creates a more compassionate interaction. What is particularly interesting about this campaign, has been the reaction to it and what this might tell us about where we are in our caring services now. The campaign appears to have struck a chord with so many people, from patients, staff, carers, managers, politicians, celebrities and the general public. This is clearly because people realise and acknowledge that it speaks to truth. Truth about what we would want when we are in need of care, or what we would expect for our loved ones. The truth is that this is often lacking from the care we currently receive. What I am really curious about is why are we in this place, a place where we need a campaign to focus our attention on something so basic and fundamental? And if that is missing what other, perhaps more significant aspects of care are neglected and why? Maybe saying hello my name is ……..is just a crumb from the loaf of bread that our budgie needs. Every difficulty and problem we face as human beings, challenges our emotional and psychological world. How it does and to what extent will be unique to every person on the planet. That is what makes the role of helper so special, so interesting and requiring of such careful thought, kindness, compassion, and honesty. Most of all the ability to listen, to listen some more and then to really listen. Listening not just to words spoken, but to those unsaid, to the relationship between the words and the actions. This is the true art of our work, and this is the food that feeds recovery. So why is this so often missing and not valued, nurtured or even mentioned in day to day practice? Could it be that for people to feed others the giver must too be fed, or have food to give. Are the bells, mirrors, ladders and perches of our systems starving our staff of the space and nourishment they need, so much so that their malnourishment means that they can’t even say hello my name is…..? Providing real care requires people to care, and to have an acknowledgement that whatever the problem, people’s emotional and psychological world is challenged or threatened. We know that healing can take place more quickly and successfully if this is acknowledged, and carers have the time and skill to engage in simple and skillful responses to how people are feeling. Is it possible that we all need to rethink a culture that doesn’t allow time, or doesn’t appear to value and seemingly takes for granted the human interactions that need to be at the heart of all that we do. Is it possible that we need to strip away the mirrors, perches, ladders and bells, and focus on the person and their story, their wishes and the help that they need. To do this by nourishing staff, giving them the care and consideration that enables them to fully engage in the relationships that truly help others. If we begin to create cultures where care is respected and valued above targets. Where listening to people, and responding to them with a focus on them feeling helped, is more important than a box to be ticked, perhaps then real outcomes, better outcomes and more permanent outcomes will naturally follow. Perhaps then our budgies might sing, break free from their cages and fly!